I’ve received a brand-new ‘Harmonic Drive’ equatorial mount CRUX-170HD about a month ago. CRUX-170HD uses a special driving mechanism different from other equatorial mounts. Baisically, almost all commercially-available equatorial mounts are worm-driven. They uses worm and worm gear system for final reduction. But there are few drawbacks here. Worm screw and worm wheel are engaged together in worm drive system. However, to achieve high precision required for astro-imaging, tension of the worm must be precisely adjusted. If the tension is not enough, guide accuracy with high payload is lowered. It may also suffer from backlash. If the tension is too strong, guide accuracy is lowered, and the gear may be damaged. If ambient temperature is changed, the tension of the gear have to be adjusted. In addition to that, because only 2-3 gear teeth are engaged in worm drive systems, they cannot withstand high torque. Worm-driven equatorial mounts have to be precisely balanced for precise guide. The Harmonic Drive is definitely better than worm drive to be used in equatorial mounts. Harmonic Drive baisically consists of only three components – Wave Generator(green), Flexipline(red), and Circular Spline(blue). If the elliptical wave generator rotates, it deforms a thin steel cylinder called flexipline, and the flexipline rotates slowly with respect to the cylinder called circular spline. Because about 1/3 of gears are always engaged, it can withstand very high torque, and there is no backlash – which means extremely high precision guiding. Harmonic Drive is actually not new – neither unpopular. They are already widely used in industrial robots. Three mars rovers, Spirit, Opportunity, and Curiosity also utilized Harmonic Drive in their wheels. Mars rovers show us one thing – extreme lifespan and reliability of Harmonic Drive. In the case of Opportunity, it is wandering around the Mars for 13 years and 5 months! But there is just one problem in Harmonic Drive – the cost. Just single gear unit of Harmonic Drive costs more than $1000 – almost equivalent to chinese-made GOTO equatorial mounts. Because two Harmonic Drive units are needed for single mount for RA and DEC, it costs a LOT much than traditional worm driven mounts. Because of the cost, there were no consumer-targeted Harmonic Drive equatorial mounts before. RST-150H from RainbowAstro. From RainbowAstro FB page. However, despite its price, zero-backlash and ultra high torque of Harmonic Drive are still effective for some consumers – who needs portable imaging mount. Recently, two companies have unveiled new Harmonic Drive equatorial mounts. RST-150H from RainbowAstro, and CRUX-170HD / CRUX-320HD / CRUX-200HDA / Triton-4500HDO from HOBYM Observatory are them. I have purchased CRUX-170HD from HOBYM observatory. Currently, there are two options available for CRUX-170HD: the one with new Harmonic Drive gear, and the one with second-hand Harmonic Drive gear. CRUX-170HD currently sells for about $5,500 for mounts with new gears and $3,500 for mounts with second-hand gears. I bought a one with second-hand gears. Because the main drive mechanism of CRUX-170HD differs from other mounts, CRUX-170HD never needs to be balanced. High torque of Harmonic Drive eliminates the need of balancing. Rated max load capacity of CRUX-170HD is 18kg/40lbs(instrument-only, for imaging) with balancing. If counterweight is not used, max load capacity decreases to 8kgs/17.6lbs. CRUX-170HD uses CSF-17-100/120-2UH for RA. Because max average rated torque of CSF-17-100/120-2UH is 39Nm, it can drive 26kg of load on 15cm from center axis without balancing. However, to protect the gear(which is extremely expensive), the stepper motor slips if a too large load is applied. CRUX-170HD with GSO RC8 on it. Actually, in my tests, CRUX-170HD well drived 13kg/28lbs load without balancing. Rated max payload is set for safety purpose, and if the pier and/or tripod is stiff enough and stable power is applied, it can withstand a lot more load. However, head-only weight of CRUX-170HD is only 4.9kg/10.8lbs(steel gear) / 4.7kg/10.4lbs(aluminium gear). Because it does not need balancing for payload up to 10kgs, it dramatically reduces the weight of equipments. Basic setup with EM-200/NEQ6 equatorial mount weighs about 26kgs/57lbs(head 16kg + 2*5kg counterweights), but similar setup with CRUX-170HD weighs less than 5kg/11lbs! It is incredible payload-to-mount-head weight ratio at about 2 if counterweight is not used, and about 4 if counterweight is used. I’ve tested CRUX-170HD with various setups on it, all without counterweight. CRUX-170HD with C9.25, 1440x sidereal rate. Epsilon-160ED with full imaging setup, 1440x sidereal rate. One disadvantage of the mount is its Boxdoerfer electronics. It lacks many function available in other controllers like SkyWatcher Synscan, iOptron Go2Nova. It does not support GOTO to NGC catalog by default, and it lacks RTC(Real Time Clock). It almost always have to be used with a connection to PC, like Temma controller from Takahashi. Now, new electronics and controller called PSY C-1 is just about to be launched in August. Autoguide test setup with CRUX-170HD. Epsilon 160 ED, STF-8300M, Orion ST80 is used. Autoguide result graph. Because I typed wrong focal length into PHD2, arcseconds value are doubled. Actual guide result is about 0.775″ RMS for RA, and 0.5″ RMS for DEC. I had performed a simple test to autoguide with the mount. I used about 12kg setup with Takahashi Epsilon 160 ED, STF-8300M with FW8 filter wheel, Orion ST80 with QHY5L-II-Mono guider. The autoguide was perfect. There is no doubt needed for the mount. There was no backlash, and the feedback to guide pulse was immediate. The mount can even act as AO(Adaptive Optics), if guide frequency is adjusted to over 10Hz. 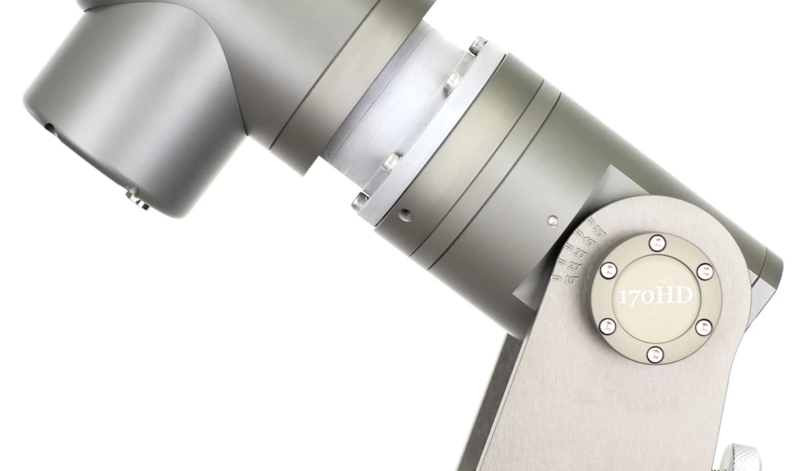 Harmonic Drive equatorial mount CRUX-170HD is perfect but its price. However, despite its price, if there is anyone to travel overseas with equatorial mount, Harmonic Drive mounts will be a perfect choice. It is ultra-high precision, backlash free, and eliminates the need of counterweights.